Celebration of Shekhawati festival takes place on 10th and 11th of February every year. It is organized by State Department of Tourism in cooperation with district administrations of Sikar, Jhunjhunu and Churu. With the objective of giving more coverage to Shekhawati festival it is celebrated at more number of local places like Nawalgarh, Sikar, Jhunjhunu and Churu. The program is comprised of 1 day touring in the region using camel rides and jeep safaris organizing farm visits. There are rural games in which every one can participate. The festival arranges cultural programs, haveli competitions and ends with fabulous fireworks bringing the region awakening scene to the outside guests. Taking a tour to your desired destination is quite an experience. However we often are left wondering what to buy as a memory for our dear ones from such destinations. If you happen to be in Nawalgarh in Rajasthan you will never find yourself at loss of spotting perfect mementos. Shopping in Nawalgarh is a delightful and refreshing experience. The local bazaar is full with all kind of local handicraft stuff. 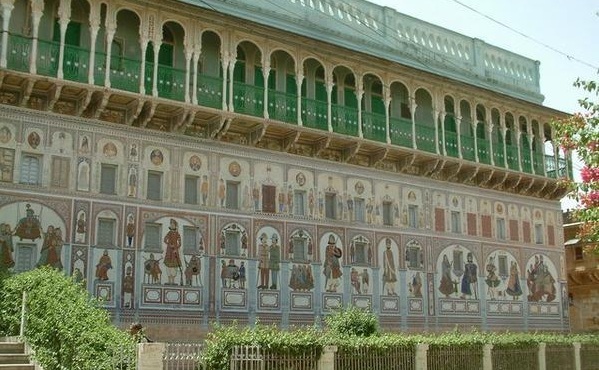 Nawalgarh is quite famous for its Shekhawati paintings, which are an integral part of all the Havelis in this township. The exquisite and beautiful murals are the main attraction for the tourists over here. The replicas of these Shekhawati paintings can be seen in the local markets which can serve as a beautiful memoir for your near relatives and friends. Local artisans with the help of their natural talents recreate the murals and frescos of the beautiful palaces and Havelis on paper or cloth which certainly are the most in demand object for visitors.